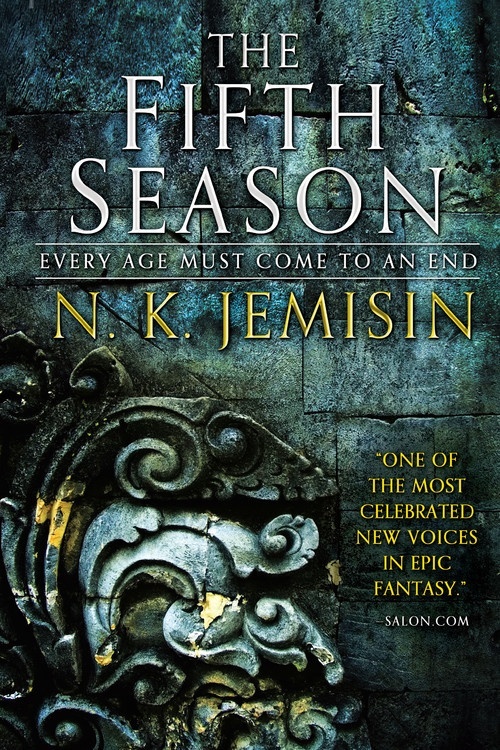 Jemisin has set a new standard for what an epic fantasy novel can and should look like. In a much more standard fantasy novel you have a hero or a group of heroes on a quest to defeat some sort of a big bad and save the country, maybe the world. In The Fifth Season, the world is continually at risk of being destroyed, but the end of the world only means the end of human civilization. The world goes on. For more than ten thousand years the world has undergone a series of cataclysms which have marked a "Fifth Season", a time of death and destruction which invariably brings the human population to a subsistence level at best. So few survive the passing of a new season. But this is where the world itself is a character, perhaps the main character. The Pangaea-esque world continent is known as The Stillness, which is notably ironic because this world, this continent is anything but still. Wracked with near constant earthquakes as the continent is crisscrossed with fault lines and volcanoes ever on the edge of erupting. The reason there is any stability at all is the presence of orogenes, men and women who can harness the geologic power of the planet. They can quell earthquakes or cause a volcanic eruption. With their control over the earth, orogenes have ensured the survival of the city-state of Yumenes, home of the orogene school The Fulcrum. Naturally, The Fifth Season opens with the destruction of Yumenes done with such power to eventually split the continent and blot out the sun with ash. This is the end of the world, again. This is a season marking cataclysm, but it is one, strangely, so easily forgotten because once Jemisin brings the reader into the stories of the three viewpoint characters of Damaya, Essun, and Syenite, we are so engaged with those individual stories that the fact that the world may have just been destroyed again somehow fades into the background. Ultimately, that is where the heart of The Fifth Season lies (and where it should lie). The entirely separate journeys of three women, three orogenes, are what binds the novel together. Except, it isn't so much a "journey" or an "adventure" in the traditional sense. Things change, the characters move from one place to another, but their journeys are as much about overcoming the expectations and oppressions of others and also the societal status quo as it is about them reaching any set destination in their lives. Those destinations aren't fixed locations. If anyone is truly transported on a "journey", it is the reader. Damaya is taken as a child to learn to control her orogene powers at The Fulcrum, and it is partly through Damaya's story that we, the readers, recognize just how oppressive this world is. Orogenes are taught that even as they learn to control their powers, they must be in turn controlled because they can never truly be trusted. Damaya's assigned Guardian breaks her hand just to demonstrate that it is he that is in control, not Damaya. Likewise, where Syenite is a fourth ring orogene (giving her a certain amount of status and power), she is not only still under the control of the Guardians, but she is also given to Alabaster, a ten ring orogene, because orogenes must produce children. Neither of them have much of a choice. The ostensible story for Syenite is to travel with Alabaster to another city and clear out the harbor of traffic blocking coral. Syenite's real story? Discovering the limits of what her choices really are. Essun's story takes place during the novel's present day, but the inciting incident of her story isn't the breaking that will cause the world to end (so we are told in the introduction), but rather the murder of her son. By her husband. Who then kidnapped their daughter. This is the story of an adult woman dealing with the unspeakable. While the worldbuilding in The Fifth Season is superb and extraordinary, it does not hold a volcano's breath to how strongly written the novel is and just how incredible these three women are. The nature of the terribly oppressive world of The Stillness, really of the Sanze Empire, is examined through the lives, actions, heartbreaks, oppression, heroism, grief, discovery, and amazing characters of Damaya, Syenite, and Essun. Jemisin will rip your heart out. 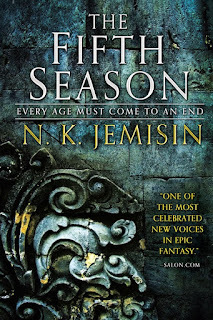 The more I think about The Fifth Season, the more I appreciate it and appreciate the various nuances it contains, and the more I anticipate but can scarcely imagine where Jemisin is going to bring us with the forthcoming second volume The Obelisk Gate. The Fifth Season is a gut punch of a novel: uncomfortable, unbelievably wrenching, and stunning. Brilliant. Bonuses: +1 for Jemisin's examination of friendship and family , +1 for three strong as hell female protagonists. These women are fully realized. Penalties: -1 because some events in the novel will be legitimately too upsetting for some readers. POSTED BY: Joe Sherry - Writer / Editor at Adventures in Reading since 2004, Nerds of a Feather contributor since 2015. Minnesotan.